Allie Bear real estate broker, rancher, cattle sales representative. Allie Bear is a native Nevadan and knows the western territory well. Since Allie grew up on a ranch, she is familiar with all aspects of ranching. She was associated with Clark Company, a real estate company out of Paso Robles, California, for some time, making a number of real estate deals through them. Currently, Allie has opened her own local Elko, Nevada real estate office, Allie Bear Real Estate. Allie knows the ins and out's of ranch lands, including cattle, horses, B.L.M. and U. S. Forest Service permits, water rights and all other land-use issues. 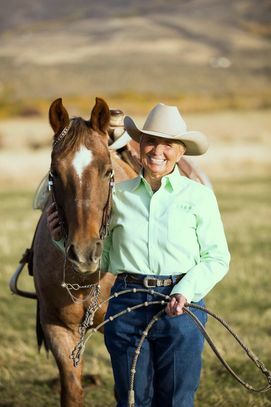 Allie specializes in Nevada ranches for sale but offers everything from acreages and horse property to investment properties. 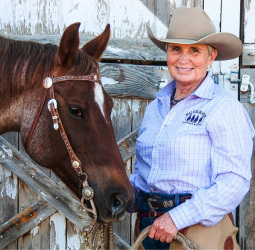 In addition to Real Estate, Allie runs her own ranch rope business and she is one of the top producing representatives for Superior Livestock Auction Company. She has shipped over 20,000 cattle a year for a number of years with Superior Livestock. Click here to read Allie Bear, "Have a Superior Day." by Mike Laughlin. A version of this article about Allie Bear "A Superior Stockwoman" appeared in the April 2003 issue of Western Horseman Magazine p.88.